‘Cycling climbs of South West England’ is the latest instalment of Simon Warren’s 100 Best Cycling Climbs Series. The format is similar to previous books, such as 100 Greatest Climbs. It is the same handy size with photo and description of climbs. Some climbs are featured in the original book, but there are many more which may or may not be well-known to those who live in this area. More interesting is to review the climbs themselves. For me, the region can be split in two. The first is the ‘deep’ South West – Cornwall, Dorset and Devon. Places which I am yet to visit on a bike. The second section is the ‘north east’ of the South West – Gloucestershire, Wiltshire and Somerset. This section has climbs which feel like an extension of my own local roads. I’ve raced up Burrington Combe so often, I have developed quite an affinity with ‘The Combe’ and other roads around the Mendips. From the book, the climbs of Devon and Cornwall looks enticing with notes of 30% ramps, and picturesque settings. The book includes Gold Hill, the village of Hovis ad fame. I would like to visit with my bike sometime. The only drawback is getting to that part of the world. Haytor is definitely on the bucket list because it was once used in the National Hill Climb Championship and is the kind of hill that would suit a tall gangly guy who goes well on Burrington and Cheddar Gorge. 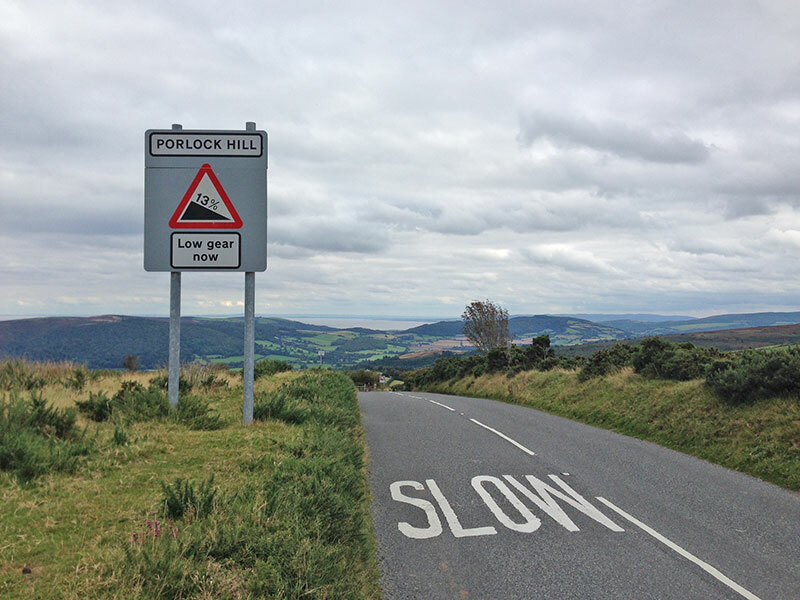 Moving up to Somerset, and we have the triple climbs around Minehead; Pollock Toll Road, Pollock A road (super steep) and Dunkery Beacon. I’ve been up all three, though rather irritatingly when I twice raced up the Porlock A Road, I had a Garmin malfunction on each occasion. I don’t believe the modern mantra of “If it’s not on Strava, it doesn’t count” but the digital record does seem to add an additional verification these days. Anyway, Pollock Toll Road is rightly lauded as an excellent climb. I even can spy a small photo of myself at the start of Pollock Toll Road in 2015. If that isn’t reason to give the book five stars, I don’t know what is. Further north-east and the book even extends into the Cotswolds and Dover’s Hill. A climb which was the venue for 2010 national (and others). In fact, on a good day, I can just about cycle to Dover’s Edge from Oxford and be back in time for tea. It’s not quite mammoth audax riding territory, but just about in range for an ordinary Oxford cyclist. I did see I had completed 40 out of 100 climbs, which brought up that modern phenomenon of ‘non-recorded digital regret’ for not recording a course record on the Cat and Fiddle e.t.c. on a stupid Garmin. Still, I intend to do more climbs sometime. 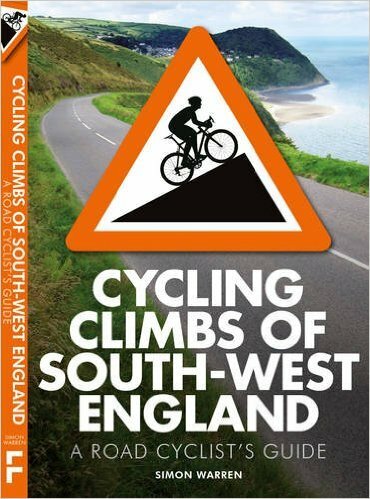 Overall, if you live within striking distance of the South West, and you like cycling up hills, this is a good book, which will appeal to those. Although quite a simple format, I find myself flicking through looking at the climbs, and just at the moment I prefer the old fashioned paper to the modern screen. I live in Devon and I have just bought this book after reading about it on here. Its a great read and has given me a load of local challenges to aim for. I was slightly disappointed that one local climb, Chineway, which i consider pure evil only got a 7/10 – my eyes have been opened! I’m surprised that you havent made it down this way. Dartmoor, as well as being a pretty magical place is full of roads that were built for someone of your calibre!